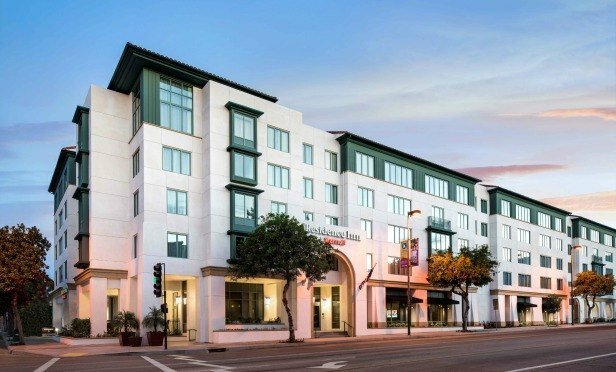 LOS ANGELES—RD Olson completes the 144-room Marriott Residence Inn, the first ground-up hotel project in Old Town Pasadena in 15 years. LOS ANGELES—It is official. Old Town Pasadena has a new hotel—its first in 15 years. R.D. Olson Development delivered the 144-room, 94.091-square-foot Residence Inn this week at a grand opening ceremony with project stakeholders Marriott International and project general contractor R.D. Olson Construction. The development company, which is known for its successful hotel projects throughout Southern California, purchased the development site out of foreclosure. The site was once entitled for a hotel project, but the entitlements had since expired. “The entitlement had expired on the property, and so we essentially bought the property unentitled,” adds Olson. “We had to go through the process, and that took four years.” The purchase price of the asset and the cost of the development were not disclosed.